Abstract: Verbascum aspinum is introduced as a new synonym of V. stachydiforme. V. songaricum subsp. subdecurrens (Scrophulariaceae) is reported for the first time from North and Northwest Iran. Distribution maps are provided for Iran. This entry was posted in Uncategorized on May 9, 2017 by admin2. Adansonia: sér. 3, 38 (1): 127-132. A new species of Verbascum L. (Scrophulariaceae) from the Gilan province (Iran), based on morphological and molecular evidences. A new endemic species from north of Iran: Verbascum parsana Sotoodeh, Attar & Civeyrel, sp. nov. is described. Considering the combination of some characteristics like ebracteolate and single flowers, violet hairs on filaments, pedicel size between 3 to 10 mm and stellate-glandular indumentum, the new species is related to Verbascum punalense Boiss. & Buhse, but several differences have been observed between the two species: the shape of the anthers, the petiole of basal leaves, the corolla size and the calyx hairs. We investigate the genetic distance of the new species with close genera using ITS and plastid regions (trnS-G, trnL-F, trnH-psbA and partial matK). The new species showed significant molecular and morphological distance from closely related species. Photos and distribution map are presented. This entry was posted in Uncategorized on December 3, 2016 by admin2. The favorite remedy for pulmonary tuberculosis in Ireland throughout recorded history and doubtless long before, known from virtually every part of that country, has been to boil the woolly leaves of Verbascum thapsus in milk, strain the thick,mucilaginous liquid produced by that and then drink it warm, twice daily. So valued has this plant been there both for that and for coughs and colds more generally, sore throats, catarrh, bronchitis and asthma that it was formerly often grown in cottage gardens, sometimes on a considerable scale. Advertisements were placed in newspapers, offering it for sale, and it was available even in the best chemists’ shops in Dublin. This entry was posted in Uncategorized on April 19, 2015 by admin2. 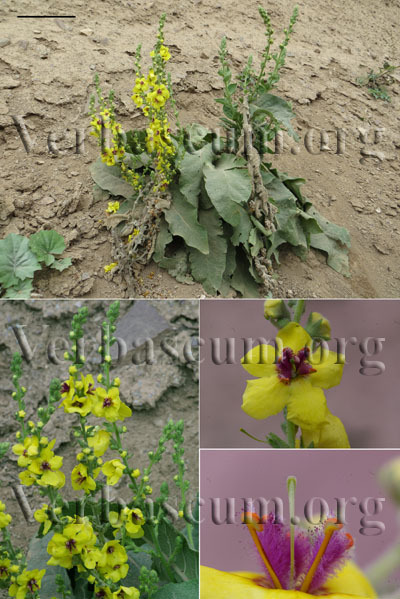 A new endemic species, Verbascum shahsavarensis, is described from north of Iran. Based on two unique characters of this species, these being two anterior longitudinally obliquely inserted anthers and an ebracteolate pedicel, we compared it to species described by Murbeck in 1933. The new species can be easily distinguished from the other Iranian species by having bi-colored hairs on the stamen filaments and the unique anther and pedicel characters. A distribution map is provided. The name of new species comes from Shahsavar, the ancient name of Tonekabon, an old coastal city at the Caspian Sea. This entry was posted in Uncategorized on March 19, 2015 by admin2. The word Taxonomy was coined by Augustin Pyramus de Candolle in 1813. Study of relationship and comparing morphological features in search of patterns for grouping organisms into units, groups or Taxa based on similarities and/or differences is classification. Simpson (1961): Systematics: The study of the kinds and diversity of organisms and any and all relationships among them. Simpson (1961): Taxonomy: the study of the principles and methods of classification. Taxonomic characters are those characteristics (feature, aspect) that are not very variable and/or show no meaningful correlation with other features. Character state: any expression of a character that can be described (and/or named) and measured. It can be qualitative (are those that have character states given in descriptive terms, like colors of petals and …) or quantitative (are those that have character states in measurable units, such as number of petals in a flower or size of leaves and …). A good character is one that serves adequately to differentiate taxonomic groups, either in a taxonomic key or in some other way. They are usually constant or vary only within defined limits within a taxonomic group and show correlations with other features. A bad character is one that can not be relied upon for such discrimination. They vary unpredictably within groups and are often environmentally plastic, and show little or no correlation with other features. (a bad character in one taxon, genus or species may can be a good character in another. Biogeography: is the study of geographic distribution of plants and animals. it concerns habitation patterns and the factors responsible for variations in distribution. Category: a particular level (or rank) in the taxonomic hierarchy, such as genus or class. It refers to an abstract level of classification. Genus (pl. genera): a category above the species and below family. Geobotany: is a biological discipline that analyses and classifies the plant communities in their natural environment. Species: is the basic category in the taxonomic hierarchy. A species is often defined as a group capable of interbreeding and producing fertile offspring. Subspecies: if the differences of taxa within a species is large, but not large enough to do a specific segregation, then the taxa should be treated as subspecies. Taxon (pl. taxa): a group with shared features at any rank. (also a particular group of organisms within a category). Variery (varietas in latin) was the first category to be used below the species level for plants. Linnaeus believed that plant changes by accidental causes due to the climate, soil, heat, winds, … is variety (small differences, in other sources). 1- Case studies in Plant Taxonomy. by Tod F. Stuessy. 3- Les plantes à fleurs; Bell. 4- and different botanical resources. This entry was posted in Uncategorized on November 24, 2014 by admin2. This entry was posted in Uncategorized on January 3, 2014 by admin2.